Today’s Dietitian shines the spotlight on the controversial sugar debate. For decades, both consumers and health experts have been pondering the potential negative health effects related to sugar consumption. The classic 1986 book Sugar Blues by William Dufty exploded onto the sugar-busting scene. People were shocked to read they were consuming, on average, 100 lbs of sugar per year. The volume on the sugar-health debate turned up a notch when a recent wave of media reports called on the opinions of Robert H. Lustig, MD, a professor of pediatrics in the division of endocrinology at the University of California, San Francisco, who’s a leader in the antisugar movement. Lustig has spoken out at several recent nutrition conferences on the adverse health effects of sugar, including the Annual Nutrition & Health Conference and the Experimental Biology meeting. Lustig reported at the Annual Nutrition & Health Conference in May 2011 that fructose intake, an egregious component in the Western diet, has doubled over the past 30 years from all its sources, including HFCS, sucrose, and juice. “The ‘fructosification’ of our food supply increases its palatability. Low-quality foods have high-fructose corn syrup added on purpose. It’s used as a browning agent,” Lustig said. He reported that our growing dependence on fructose has fueled the obesity and type 2 diabetes epidemics and has led to increased energy intake, decreased resting energy expenditure, excess fat deposition, nonalcoholic fatty liver disease, insulin resistance, hyperglycemia, cardiovascular disease, and metabolic syndrome in humans. Lustig’s views on sugar and health bring to light the crux of the sugar argument, raising the question, is there proof that the negative impact of sugar extends beyond its provision of empty calories? The 2009 American Heart Association (AHA) Scientific Statement on Dietary Sugars Intake and Cardiovascular Health reported that excessive consumption of sugars has been linked with several metabolic abnormalities and adverse health conditions. Though the mechanisms are unclear, relative to other carbohydrate sources, sugar intake appears to be associated with increased triglyceride levels, a known risk factor for coronary heart disease, and some studies show that a higher consumption of high-sugar beverages and foods is associated with increased inflammation and oxidative stress, according to the AHA. Consider that our early ancestors never knew the intensely sweet flavor of refined sugar; they knew only honey and fruit. Since early humans had to battle the bees for a taste of honey, the mild natural sweetness of sugar—which came packed with nutrients and fiber—defined our knowledge of sweetness. Fueling the sugar debate is consumers’ confusion over the effects of HFCS, which has received the lion’s share of public scrutiny on the sugar front, even to the point where consumers often consider cane sugar to be healthful in comparison. However, most nutrition experts consider all added sugars, such as HFCS, table sugar, and honey, to be similar in their effects. Indeed, some studies have found that low-GI diets can reduce the risk of heart disease, inflammatory diseases,10,11 and type 2 diabetes.12 Consuming low-GI carbs also may delay hunger and reduce subsequent energy intake compared with higher-GI carbs.13 And some research has found weight-loss benefits with low-GI diets.14 However, not all studies have found such promising results, and investigators stress that more research is needed. At the Annual Nutrition & Health Conference, Lustig said, “Fructose induces insulin resistance.” But Klurfeld says that while it was once thought that high sugar intake promotes insulin resistance, this was disproven. “If someone consumed nothing but glucose in large amounts, this might occur, but since we consume a mixture of sugars, it doesn’t happen. In fact, fructose doesn’t require insulin for its metabolism,” Klurfeld says. The AHA guidelines on sugar call for a prudent upper limit intake of one-half of the discretionary calorie allowance, which for most American women is no more than 100 kcal/day and for most American men no more than 150 kcal/day from added sugars.2 Both Brownell and Gazzaniga-Moloo recommend using these guidelines for educating the public. 1. Profiling food consumption in America. In: US Department of Agriculture. Agriculture Fact Book 2001-2002. Washington, DC: US Government Printing Office;13-21. 2. Johnson RK, Appel LJ, Brands M, et al. Dietary sugars intake and cardiovascular health: a scientific statement from the American Heart Association. Circulation. 2009;120(11):1011-1020. 3. The science of sugars. Food Insight newsletter. 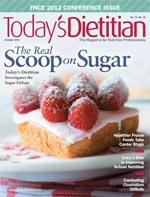 http://www.foodinsight.org/Newsletter/Detail.aspx?topic=The_Science_of_Sugars. June 2012. Accessed July 16, 2012. 4. Is sugar toxic? CBS News website. http://www.cbsnews.com/8301-18560_162-57407294/is-sugar-toxic. April 1, 2012. Accessed July 15, 2012. 5. Taubes G. Is sugar toxic? The New York Times website. http://www.nytimes.com/2011/04/17/magazine/mag-17Sugar-t.html. April 13, 2011. Accessed July 15, 2012. 6. US Department of Agriculture, US Department of Health and Human Services. Dietary Guidelines for Americans, 2010. 7th ed. Washington, DC: US Government Printing Office; 2010. 7. Bray GA, Nielsen SJ, Popkin BM. Consumption of high-fructose corn syrup in beverages may play a role in the epidemic of obesity. Am J Clin Nutr. 2004;79(4):537-543. 8. Havel PJ. Dietary fructose: implications for dysregulation of energy homeostasis and lipid/carbohydrate metabolism. Nutr Rev. 2005;63(5):133-157. 9. Glycemic index and diabetes. American Diabetes Association website. http://www.diabetes.org/food-and-fitness/food/planning-meals/glycemic-index-and-diabetes.html. Accessed July 20, 2012. 10. Dong JY, Zhang YH, Wang P, Qin LQ. Meta-analysis of dietary glycemic load and glycemic index in relation to risk of coronary heart disease. Am J Cardiol. 2012;109(11):1608-1613. 11. Brand-Miller J, Buyken AE. The glycemic index issue. Curr Opin Lipidol. 2012;23(1):62-67. 12. Villegas R, Liu S, Gao YT, et al. Prospective study of dietary carbohydrates, glycemic index, glycemic load, and incidence of type 2 diabetes mellitus in middle-aged Chinese women. Arch Intern Med. 2007;167(21):2310-2316. 13. Roberts SB. Glycemic index and satiety. Nutr Clin Care. 2003;6(1):20-26. 14. Esfahani A, Wong JM, Mirrahimi A, Villa CR, Kendall CW. The application of the glycemic index and glycemic load in weight loss: a review of the clinical evidence. IUBMB Life. 2011;63(1):7-13. 15. Liese AD, Schulz M, Fang F, et al. Dietary glycemic index and glycemic load, carbohydrate and fiber intake, and measures of insulin sensitivity, secretion, and adiposity in the Insulin Resistance Atherosclerosis Study. Diabetes Care. 2005;28(12):2832-2838. 16. Insulin resistance and prediabetes. National Diabetes Information Clearinghouse website. http://diabetes.niddk.nih.gov/dm/pubs/insulinresistance. Updated December 6, 2011. Accessed July 20, 2012. 17. Pi-Sunyer X. Do glycemic index, glycemic load, and fiber play a role in insulin sensitivity, disposition index, and type 2 diabetes? Diabetes Care. 2005;28(12):2978-2979. 18. Daly M. Sugars, insulin sensitivity, and the postprandial state. Am J Clin Nutr. 2003;78(4):865S-872S. 19. Lau C, Faerch K, Glümer C, et al. Dietary glycemic index, glycemic load, fiber, simple sugars, and insulin resistance: the Inter99 study. Diabetes Care. 2005;28(6):1397-1403. 20. Davis JN, Ventura EE, Shaibi GQ, et al. Reduction in added sugar intake and improvement in insulin secretion in overweight Latina adolescents. Metab Syndr Relat Disord. 2007;5(2):183-193. 21. Yoshida M, McKeown NM, Rogers G, et al. Surrogate markers of insulin resistance are associated with consumption of sugar-sweetened drinks and fruit juice in middle and older-aged adults. J Nutr. 2007;137(9):2121-2127. 22. DiMeglio DP, Mattes RD. Liquid versus solid carbohydrate: effects on food intake and body weight. Int J Obes Relat Metab Disord. 2000;24(6):794-800. 23. Babey SH, Jones M, Yu H, Goldstein H. Bubbling over: soda consumption and its link to obesity in California. Policy Brief UCLA Cent Health Policy Res. 2009;(PB2009-5):1-8. 24. Fung TT, Malik V, Rexrode KM, Manson JE, Willett WC, Hu FB. Sweetened beverage consumption and risk of coronary heart disease in women. Am J Clin Nutr. 2009;89(4):1037-1042.